The use of warfarin or other oral anticoagulants (OACs) for atrial fibrillation (AF) in the elderly remains a topic of interest. Of note, a number of recent studies1,2 have suggested that elderly patients in AF remain undertreated, a particular concern given the increased incidence of cardioembolic events in this population. In my experience, although attitudes have changed somewhat there remains a persistent reluctance to anticoagulate the very old for AF without an obvious appreciation that its actually debatable whether age or any of its concomitants are independent risk factors for major bleeding. I thought this issue might become even more forefront as direct thrombin inhibitors gain wider use. An Italian study published this week in Circulation3 looked at the incidence of major bleeding in a population of over 80s and concluded that the rate was no more than in the AF population as a whole i.e. roughly 1.8-2 % per annum. The major criticism of this prospective collaborative study is that patients were selected after a referral to anticoagulation clinic had been made and on that basis may have already at some stage been deemed suitable or safe candidates for warfarin therapy. Furthermore almost all of the bleeds occurred whilst in the therapeutic range of INRs thereby not accounting for bleeds secondary to poorly controlled INRs (whether or not this problem can be directly or indirectly related to age in someone nave to an OAC regimen). The study did identify that within the population there was a modestly higher risk of major bleeding in the first three months of initiation, in those with previous bleeds or active cancers or who had a history of falls. 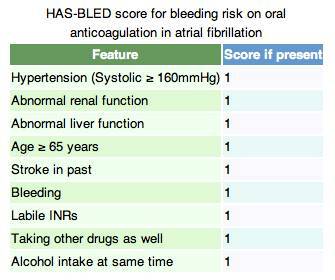 The guideline most widely used in the UK for making decisions regarding anticoagulation in patients with concerns over bleeding is the HASBLED4 score (see below), recently validated for warfarin and the direct thrombin inhibitor, ximelagatran5. Notably this score identified age over 65 as an important risk factor for major bleeding although it does not look specifically into whether this is an epiphenomenon of other factors more prevalent in the elderly such as polypharmacy, co-morbidities or falls. Furthermore, according to recommendations HASBLED scores more than 3 generally mean its recommended that INRs are monitored more closely rather than alternative treatments to OACs adopted e.g. aspirin alone or no treatment6. Its not known how prevalent use of these guidelines is, and in my experience often a decision to commence OACs in AF is made on the balance of patient preference, particularly as they continue to be unpopular drug regimens. The HASBLED score does appear to have a reasonable utility in guiding the use of dual antiplatelet therapy with OACs following elective coronary stenting6. From the major trials in this field (see below), what can be concluded is that antiplatelet agents are not appropriate substitutes for OACs where age or bleeding risk are a primary concern. At present there appears to be some limited promise of reduced risk of bleeding from direct thrombin inhibitors over warfarin although assessment by NICE is outstanding (expected end of this year). SPORTIF II9 RCT in 2003 (n=254) Ximelagatran vs. warfarin showing no difference in risk of thromboembolic events or bleeding. RE-LY10 RCT in 2009 (n=18113) Dibigatran vs. warfarin. Risk of thromboembolism similar with lower major bleeding rates in dibigatran group but higher GI bleed rate. AVERROES11 RCT in 2011 (n=5599) Abipixan vs aspirin in patients deemed unsuitable or unwilling for OACs due to bleeding risk (including the elderly) showing reduced risk of thromboembolism without increased risk of bleeding. Widely criticised due to lack of evidence of for bleeding risk on OAC in this population. One issue that appears commonly cited as a reason anticoagulation is avoided in elderly patients with AF is where there is a history of falls. Indeed, most of the above trials have incorporated falls into the risk assessment and concluded elderly patients who fall are at an increased risk of major bleeding. However this has universally been looked at in a binary sense and no trial has looked specifically at how many falls are required to offset the known benefit of anticoagulation in this age group. Interestingly, a modelling study undertaken in 1999 an elderly population in Canada12 suggested that 295 falls are needed in one year before the risk of bleeding outweighs the benefit in any given patient in AF over 75 an extrapolated number but interesting given the number of falls per year seen in the at risk group from this weeks Italian study was 2 or more! For the time being, warfarin or alternative OACs are appropriate treatments for AF in the old (>75) or very old (>80 years old) where INRs can be appropriately monitored. There is currently no evidence that age alone is a factor in major bleeding on OACs although the risk of concomitants of age (polypharmacy and its administration, falls and co-morbidities) warrants further study. Whittle J, Wickenheiser L, Venditti LN. Is warfarin underused in the treatment of elderly persons with atrial fibrillation? Arch Intern Med. 1997 24;157(4):441-5. Brophy MT, Snyder KE, Gaehde S, Ives C, Gagnon D, Fiore LD. Anticoagulant use for atrial fibrillation in the elderly. J Am Geriatr Soc. 2004;52(7):1151-6. Poli D, Antonucci E, Testa S, Tosetto A, Ageno W, Palareti G; for the Italian Federation of Anticoagulation Clinics (FCSA). Bleeding Risk in Very Old Patients on Vitamin K Antagonist Treatment: Results of a Prospective Collaborative Study on Elderly Patients Followed by Italian Centres for Anticoagulation. Circulation. 2011;124(7):824-829. Pisters R, Lane DA, Nieuwlaat R, de Vos CB, Crijns HJ, Lip GY. A novel user-friendly score (HAS-BLED) to assess 1-year risk of major bleeding in patients with atrial fibrillation: the Euro Heart Survey. Chest. 2010;138(5):1093-100. Bhatt DL et al., CHARISMA Investigators. Clopidogrel and aspirin versus aspirin alone for the prevention of atherothrombotic events. N Engl J Med. 2006;354(16):1706-17. Mant J, Hobbs FD, Fletcher K, Roalfe A, Fitzmaurice D, Lip GY, Murray E; BAFTA investigators Warfarin versus aspirin for stroke prevention in an elderly community population with atrial fibrillation (the Birmingham Atrial Fibrillation Treatment of the Aged Study, BAFTA): a randomised controlled trial. Lancet. 2007;370(9586):493-503. Petersen P, Grind M, Adler J; SPORTIF II Investigators. Ximelagatran versus warfarin for stroke prevention in patients with nonvalvular atrial fibrillation. SPORTIF II: a dose-guiding, tolerability, and safety study. J Am Coll Cardiol. 2003;41(9):1445-51. Connolly SJ, Ezekowitz MD, Yusuf S, Eikelboom J, Oldgren J, Parekh A, Pogue J, Reilly PA, Themeles E, Varrone J, Wang S, Alings M, Xavier D, Zhu J, Diaz R, Lewis BS, Darius H, Diener HC, Joyner CD, Wallentin L; Dabigatran versus warfarin in patients with atrial fibrillation N Engl J Med. 2009;361(12):1139-51. Connolly SJ, Eikelboom J, Joyner C, Diener HC, Hart R, Golitsyn S, Flaker G, Avezum A, Hohnloser SH, Diaz R, Talajic M, Zhu J, Pais P, Budaj A, Parkhomenko A, Jansky P, Commerford P, Tan RS, Sim KH, Lewis BS, Van Mieghem W, Lip GY, Kim JH, Lanas-Zanetti F, Gonzalez-Hermosillo A, Dans AL, Munawar M, O'Donnell M, Lawrence J, Lewis G, Afzal R, Yusuf S; AVERROES Steering Committee and Investigators. N Engl J Med. 2011;364(9):806-17. Man-Son-Hing M, Nichol G, Lau A, Laupacis A. Choosing antithrombotic therapy for elderly patients with atrial fibrillation who are at risk for falls. Arch Intern Med. 1999;159(7):677-85.